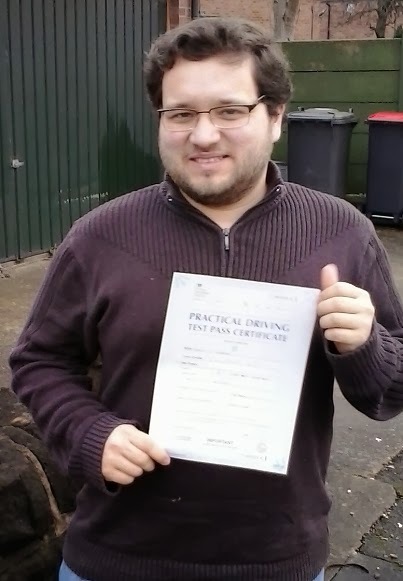 Russ Chaplin's Driving Instructor Blog: He's Passed His Driving Test! It was a great morning for Taha Ismaeil when he passed his driving test at Beeston here in Nottingham. It can be tricky in Beeston at the moment. The building of the new tram line means heavy traffic congestion making arriving on time a bit of a nightmare. I got to feeling tense on the way there as the minutes ticked away with no end to the traffic jam in sight. A quick turn and a change of route and we made it with about two minutes to spare. Taha wanted me to ride out on the test with him which is not something I usually like to do. it can make a pupil more nervous to have three people in the car. I am not allowed to say anything and cannot interfere in any way in case it's thought I am trying to assist the pupil. The car is also heavier which can affect moving off. Taha seemed to be okay with the three of us though and put in a good drive. The left hand reverse was a bit tough as it was uphill and on a tight corner on a busy road. Plenty of stopping and starting but good observations meant Taha didn't miss a thing and he pulled it off nicely. Following the car in front led to us going off the test route but we were soon back on it without incident. A good result and a great start to the day. it's been a long one finishing with me writing this. I might kick back and do some video gaming now. Ciao.